“Fight them and God will punish them!” he yelled. I am not sure whether you are helping yourself there Saddam. You know, when people accuse you of murdering tens of thousands of innocent human beings, men, women and children, it might, umh, send the wrong message when you suddenly quote violent verses of your holy book. 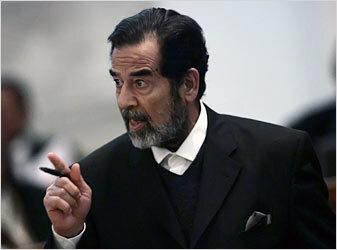 The judge then told the guards to remove Saddam: a co-defendent stood up and started insulting the prosecutors. When a guard tried to push him back into his chair he “threw a punch”. Of course, he – Hussein Rashid Mohammed – was thrown out as well. The court on Monday heard testimony about burying alive prisoners and sexually abusing female detainees. Saddam and his fellow defendants are charged with acts of genocide against Iraqi Kurds during a crackdown in the late 1980s in which an estimated 180,000 people were killed. If convicted, the defendants could be sentenced to death by hanging.